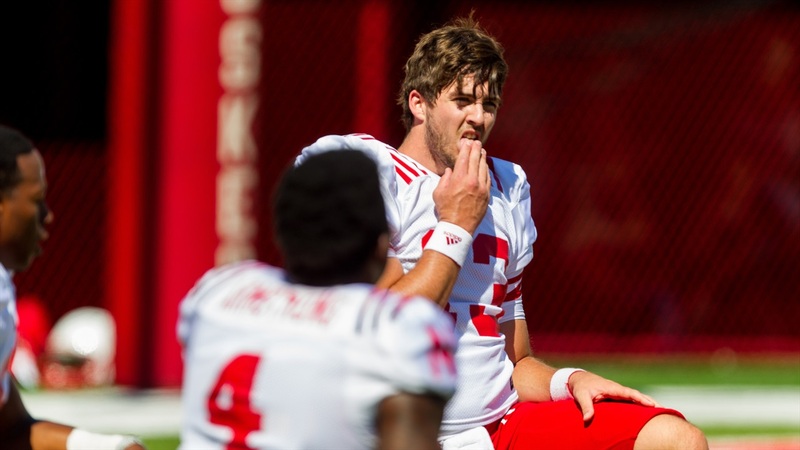 The Huskers moved practice over to Memorial Stadium on Thursday morning and opened the practice up to the media as the team split the time between scrimmaging, position drills and situational work. The bad news of the day was an injury update provided by Coach Mike Riley after practice, but the highlight came right at the end as the Huskers wrapped up about half an hour earlier than normal thanks to junior guard Jerald Foster. Riley gathered the team together about an hour-and-a-half after practice began and challenged the 6-foot-3, 310-pound Foster to field a punt from Caleb Lightbourn. Despite a difficult punt by Lightbourn, Foster stepped up to the challenge and pulled in the ball on a dead sprint toward the sideline. After practice, offensive coordinator Danny Langsdorf offered his evaluation of the day’s action. >> Sophomore running back Tre Bryant was on the list of players who missed practice, but Langsdorf said he isn’t worried about the tailback. >> One noteworthy observation from practice was that redshirt freshman Boe Wilson got most of the first-team reps at right guard in place of junior Tanner Farmer. Foster, the established starter at left guard, is a fan of Wilson as well. Langsdorf did highlight a few areas the offensive line needs to improve in as camp rolls on. Offensive line coach Mike Cavanaugh has said that he welcomes the burden of making the offense go for his unit, and junior running back Devine Ozigbo said he is seeing progress. >> With the injuries, freshman walk-on wide receiver Christian Banker and redshirt freshman walk-on tight end Brandon Hohenstein got the call-up to join the 105-man fall camp roster. >> Limited numbers at wideout is something receivers coach Keith Williams and the Huskers are far too familiar with at this point after suffering injuries at the position every year in Lincoln. Williams highlighted walk-ons Gabe Rahn and Brett Classen as two of the less experienced receivers who have impressed him so far. Freshman wide receiver Jaevon McQuitty has been in Lincoln for less than a year but has already suffered two major setbacks, first a shoulder injury during spring and know the knee injury that has knocked him out for the year.